When you die your character will be teleported to your home temple. There is a chance that you will lose 1 item from your character's inventory, unless you are blessed, in which case the blessing will be lost instead. If you are not blessed at the time of death and lose an item, it will be put in the body of your character and is retrievable by anyone at the location of death for 30 minutes. Additionally, when you die you will lose 2% of your total experience, magic level and skills. If your account has active premium time these death losses are reduced to 1.5%. 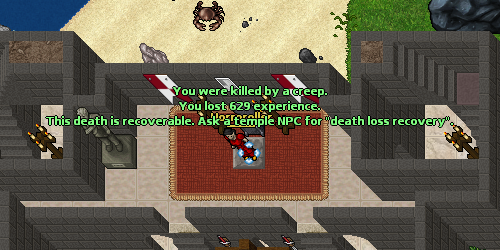 Temple NPCs can also recover 75% of your lost experience, magic level and skills in return for a donation to the temple NPC after death. The donation amount is 250 gold per level until 30, and 450 gold for each level over 30. The level accounted is the one at time of death. Note that if you were involved in PVP (non-party) prior to the death it will not be recoverable! Only the 3 most recent deaths may be reversed. You have 30 from time of death to recover it.